No phone can compete the Redmi Note 5 Pro in this price range. The device offers great specifications. It has bezel-less display, big battery, dual cameras. A great performance and overall value for money. The Xiomi Redmi Note 5 Pro is no doubt a great phone. If you are looking for a mid range device having great features, then don&apos;t look further just go for this phone. - We have to press the power button to use face unlock feature. Xiaomi Redmi Note 5 Pro is a smartphone which covers the budget price segment giving you a moderate balance between price and performance. The smartphone runs on the latest processor meaning you&apos;re going to get decent power out of it. When it comes to cameras, it is just an average at least I was not impressed by it. You can go still go with this device if you care about performance more. Xiaomi Redmi Note 5 Pro is the higher variant of already launched Redmi Note 5. It has better cameras, better professor and better overall performance. The smartphone has amazing battery life which does adds up to a weight a little bit. It has decent performance with average cameras. According to me, the Redmi Note 5 Pro is really a good and perfect phone. One who is not brand conscious and just wants to enjoy good features can go for this phone. The looks and features are outstanding. 20 Pricebaba users have written their experience with Xiaomi Redmi Note 5 Pro 6GB RAM. 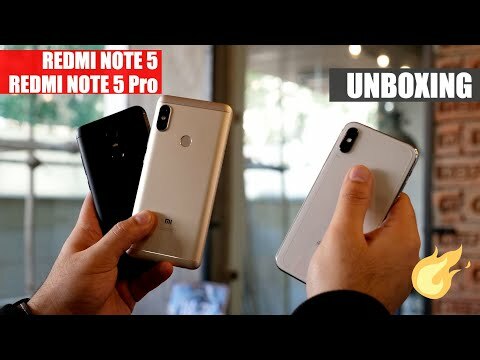 If you own Xiaomi Redmi Note 5 Pro 6GB RAM, please do leave your feedback too. Lowest price of Xiaomi Redmi Note 5 Pro 6GB RAM price in India starts at Rs. 13,320 Xiaomi Redmi Note 5 Pro 6GB RAM is available on Flipkart at Rs. 13,999 and on Amazon at Rs. 13,320. Prices updated on 25th April 2019. On the first look, the phone bears some aesthetic traits from the iPhone X. The camera on the back is arranged just like the one on Apple's flagship device. On the front, things change a bit. Thankfully, it doesn't have a notch on top of its display. The front of the phone does integrate a bezel-less design with a large 5.99-inch Full HD+ panel having an 18:9 aspect ratio and a resolution of 2160 x 1080 pixels. This makes the phone suitable for viewing all types of content. In terms of its build, it sports a metal unibody design with re-enforced corners to protect it from damage if it falls. The rear camera of the phone is one of its major selling points. The smartphone is fitted with a dual-rear camera setup which comprises of a 12MP primary sensor coupled with a secondary 5MP snapper. This allows the phone to use some software based enhancements to capture more aesthetic images. Up front, it has a 20MP sensor which is coupled with a selfie flash. The high-resolution camera allows for great selfies in both good as well as poor lighting. On the software side of things the phone ships with MIUI 9 based on Android 7.1 Nougat. The Redmi Note 5 Pro is expected to receive Oreo in the following months. Underneath its hood, the Redmi Note 5 Pro is powered by the all-new Snapdragon 636 processor which is a highly efficient chipset. This is coupled with a massive 6GB of RAM to breeze you through anything you can throw at it. On the storage side of things, this smartphone is packed with 64GB internal memory which can be expanded up to 128GB through its hybrid microSD card slot. As far as connectivity is concerned, the phone allows for all the conventional solutions including 2G, 3G, 4G with VoLTE, Bluetooth, NFC and dual-band WiFi. To charge the phone and transfer data, you can do so through the micro USB port located on the bottom. Speaking of charging, it does support Quick Charge 2.0, so if you do happen to drain out its 4,000mAh battery before the end of the day, you can quickly top it up. Ans: Yes, this phone supports VoLTE out of the box and should fine with Jio network. Ans: Yes this phone has a hybrid second slot so you will have to sacrifice your second SIM in lieu of expandable storage. Ans: Yes, out of the box, the phone will run on Android Nougat and is expected to be updated to Oreo in the coming months. Ans: It has a 20MP selfie camera so expect a good image quality for selfies.